Here’s an easy 30 minute dinner idea for you! 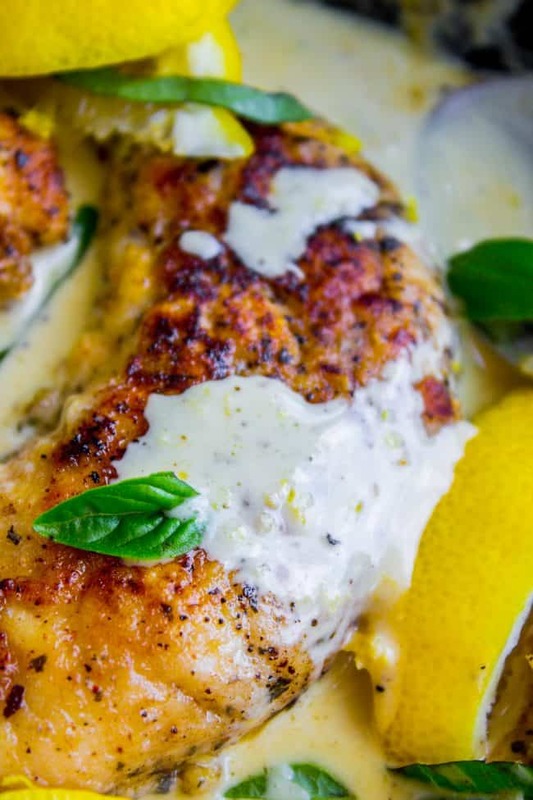 Pan Seared Chicken in Lemon Basil Cream Sauce is super easy to throw together, and uses up some of that fresh garden basil. Chicken tenderloins are quick to cook on the stovetop, and the sauce has such bright lemony flavor! I’ve been trying to teach my older kids about the level of emergency they should have in their voice for things that are actual emergencies. They always get it backwards. Like, every time the baby does something like flood the bathroom (that happened last week, she had the faucet on full blast and flooded the floor with a half inch of water while she happily dumped Clorox wipes into the toilet), the older kids barely look up from reading their book to tell me about it. But when someone has not shared a toy or scraped their knee, it’s like a 3 alarm fire going off. Summer time around here means sleeping in and pool days and tons of basil in the garden. 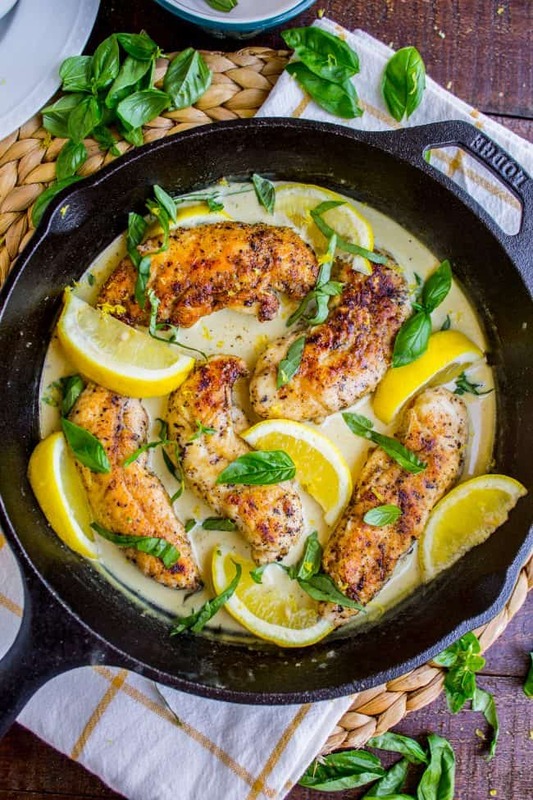 That’s what inspired this lemony basil pan seared chicken! I was not feeling like spending a ton of time on dinner (who is?) 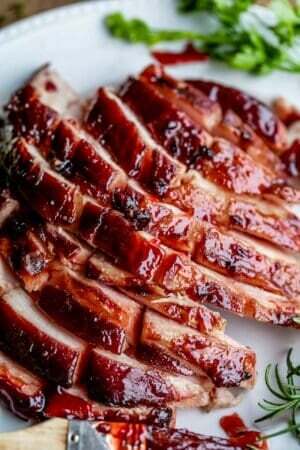 and pan seared chicken is always fast and easy. 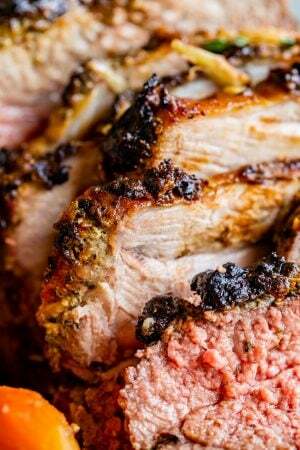 The sauce has TONS of flavor because we’re using 1/3 cup of lemon juice and a bunch of zest. You will probably need 2 lemons. I think it’s perfect, but if you are not seriously into bright lemon flavor, you might want to skip the zest or cut the juice down to 1/4 cup. But I’m in it for the win so bring on that lemon flavor. I wanted the sauce to be lemon-basil flavor, so I added some chopped basil to the sauce while it was still cooking, which I already knew was a bad idea. You’re only supposed to add fresh herbs AFTER you turn off the heat. But I was like, how bad could it be? Guys, don’t do it. The basil turns a nasty shade of brown. I don’t know why I always feel the need to try out this stuff that I’ve read in books 100 times. Like the one time I tested out whether or not you REALLY need to dissolve corn starch in cold water? Can’t you just do it in hot water? Everyone says you can’t but let’s just try it….NOPE lumpiest gravy ever. When will I learn?? So anyway, don’t be like me, add the basil after you take the pan off the stove. Even though you probably already knew that. 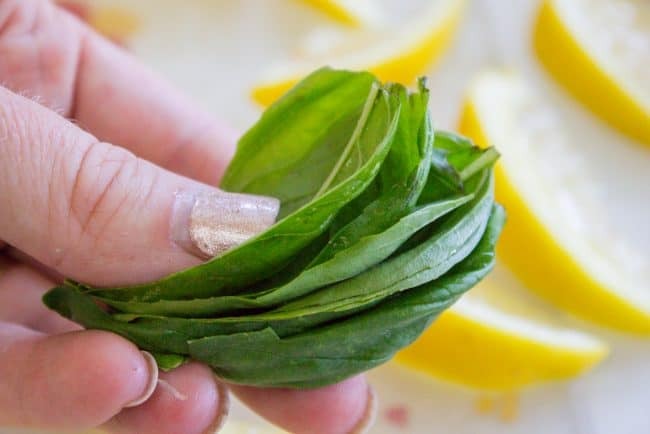 Here’s how to chiffonade fresh basil. Except I think you’re supposed to roll the basil leaves lengthwise instead of how I did it here. So I messed that up too. What is it with me and the basil failures today?? 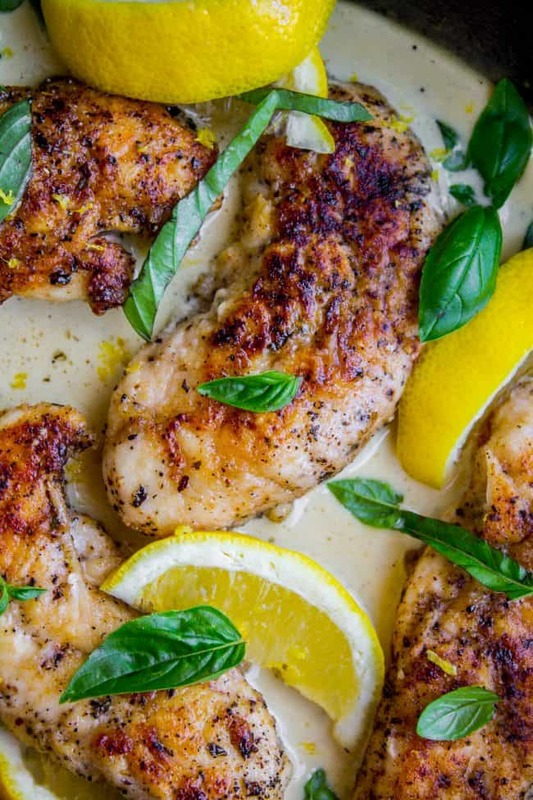 I think this lemony pan seared chicken would go really well over pasta, rice, Creamy Mashed Potatoes, or 3 Ingredient Roasted Potatoes with Crunchy Onions. Or maybe just alongside a nice big salad. Like maybe this Apple Gorgonzola Salad? Ooh or maybe this super easy Green Salad with Feta and Beets! Here's an easy 30 minute dinner idea for you! 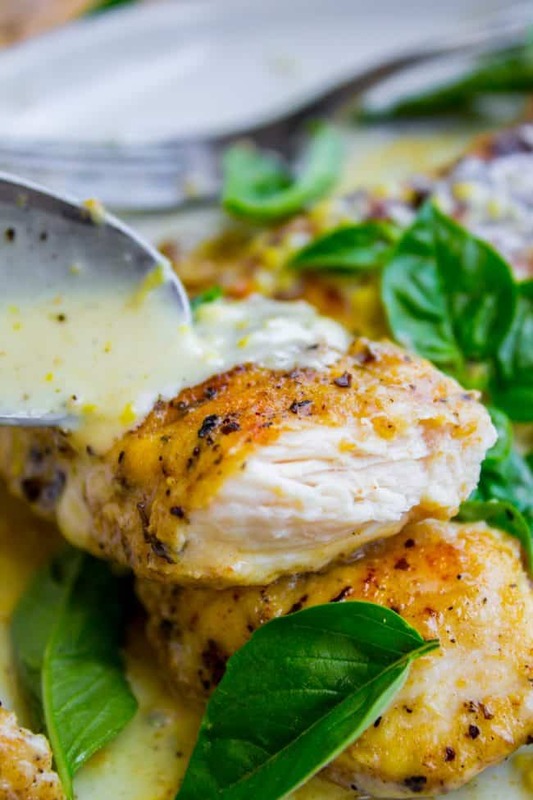 Pan-seared Chicken in Lemon Basil Cream Sauce is super easy to throw together, and uses up some of that fresh garden basil. 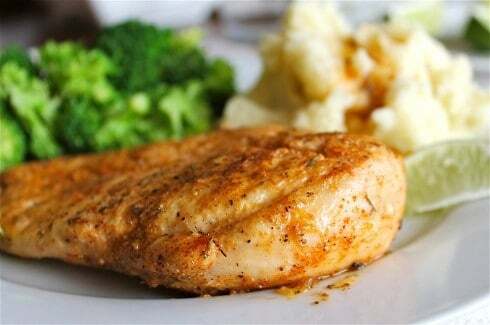 Chicken tenderloins are quick to cook on the stovetop, and the sauce has such bright lemony flavor! Dry the chicken tenderloins with a paper towel. On a plate or shallow dish, mix together the flour and spices: basil, salt, pepper, cayenne, garlic, and onion. Dredge the chicken in the flour mixture to coat both sides. Heat a large skillet to medium high heat. When it is hot, add 1 tablespoon butter and 1 tablespoon oil, and swirl to coat. Add about half the chicken tenderloins. Don't add them all at once or they will steam, not sear, and that won't get you those nice crispy brown edges. Leave about an inch in between each piece of chicken. Sear for about 4 minutes. Keep an eye on it and make sure it's not cooking too quickly. Turn the heat down to medium if necessary. Flip the chicken and cook for another 2 minutes or so, until brown. Remove the chicken to a plate and sear the other batch, adding more oil if the pan gets dry. When the chicken is done and out of the pan, add the chicken broth and lemon juice. Keep the heat on medium high. Scrape up the browned bits with a wooden spoon. Bring to a boil and simmer for about 3 minutes. Add the cream. Bring to a simmer again and continue simmering for 5-8 minutes until the sauce has thickened some. Remove from heat and add fresh basil and lemon zest. Return the chicken to the pan. Serve with pasta, rice, mashed potatoes, cauliflower rice, etc. *I always use water and Better Than Bouillon Chicken Base to make my broth at home. I love this stuff! **My favorite kitchen tool is my microplane grater. It makes zesting lemons SO EASY. It is the best 12 bucks you will ever spend on a kitchen item. 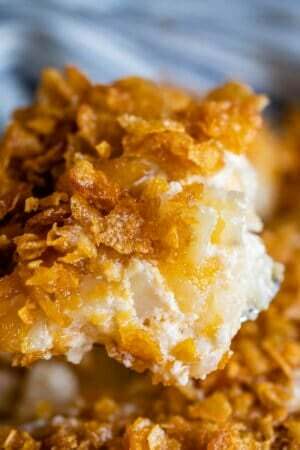 More easy chicken recipes for summer! 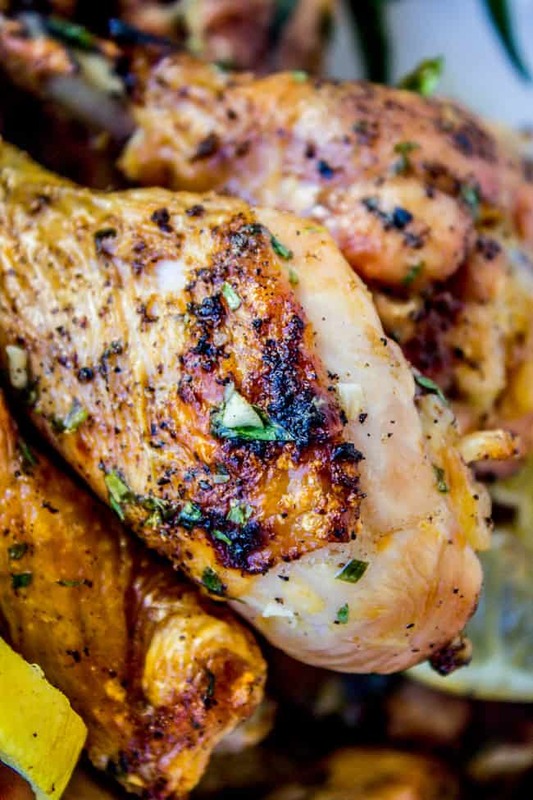 Garlic Lime Chicken << this is so easy and so good. Oldie but a goodie. 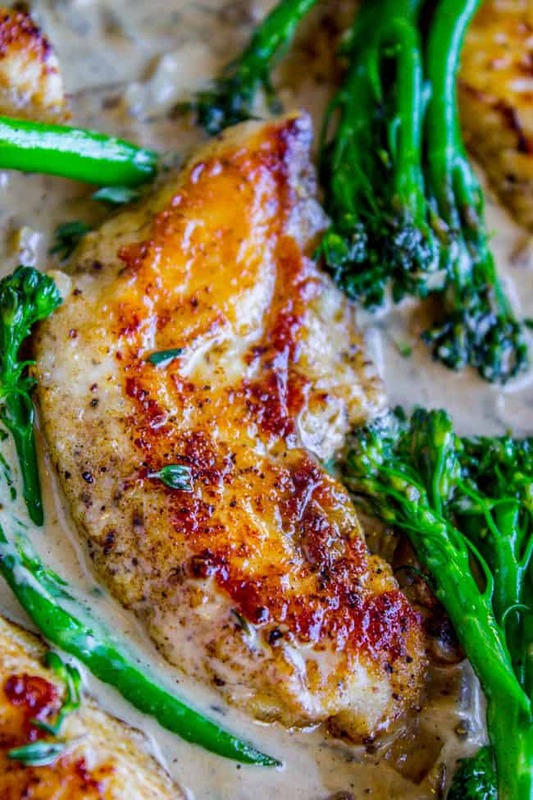 Pan-Seared Chicken and Broccolini in Creamy Mustard Sauce << this one is really popular! 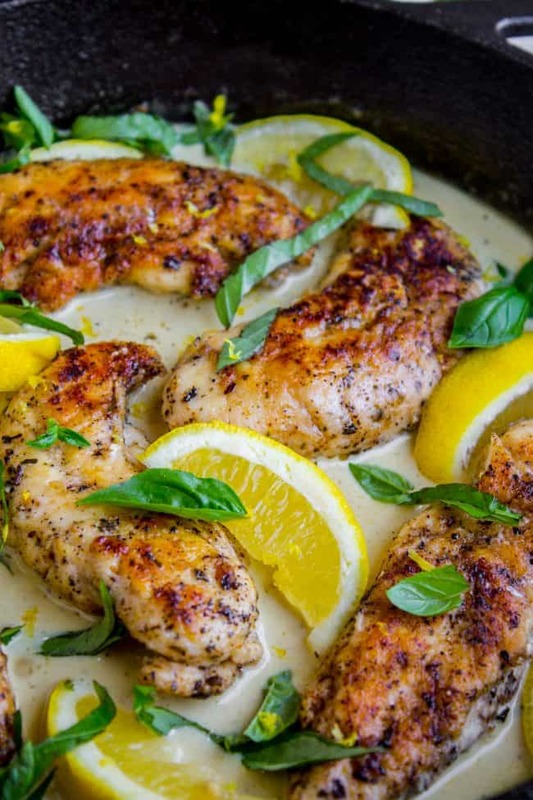 More lemon chicken recipes you will love! I made this last night for dinner. Have to admit, I did not follow the recipe exactly: used half the chicken and twice the cream, so I had to let it simmer to thicken for quite a while. I added A LOT of lemon/zest. Absolutely loved it and will definitely make it again! Half the chicken, twice the cream. Words to live by ;) You can make me dinner anytime, especially if you love lemon zest as much as I do! I’m so glad you liked the recipe Marliz, and thank you so much for stopping to leave a comment! It’s so good to hear your feedback. This looks incredible. I love cream sauces and this will be a new one for me. I can’t wait to try it!! Cream sauces really are the best, right?? Thanks for stopping by Stephanie! Being keto, I used coconut flour instead! Worked great. Love a microzester!!!! That’s genius Shelly! My husband just started doing the keto diet, he’s lost 9 pounds so far! I love ur funny but true comments about ur kids..having raised 5 of my own, it brought back some hilarious memories..n the bird recipe is great!! Keep it up!! 5 kids, you are a pro mom Barb! I’m the youngest of 5, so I know what a zoo it is :) Good to hear from you! Let me know if you get a chance to try the recipe! 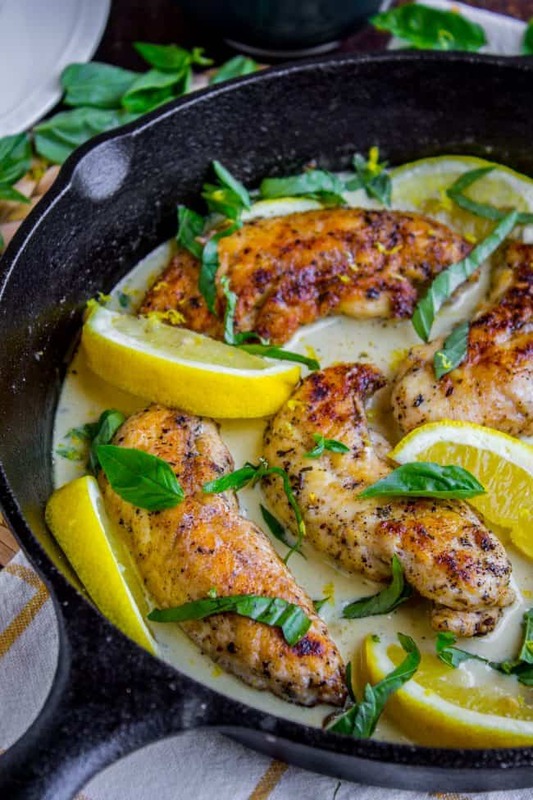 This Pan Seared Chicken in Lemon Basil Sauce recipe looks delicious and I’m planning on making it tonight. Did you maybe leave out a step? Do you dredge the tenders in the flour and spice mix first before adding them to the pan? Or do you sear them first, then add the flour and spice mix to chicken broth when making the sauce? 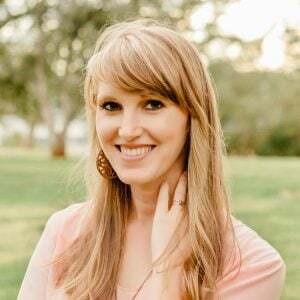 Love your recipes and sense of humor! Oh my goodness, I’m such a dork Suzie! Yes I left out the dredging step, eep! Thanks for noticing that and being kind enough to leave a comment. 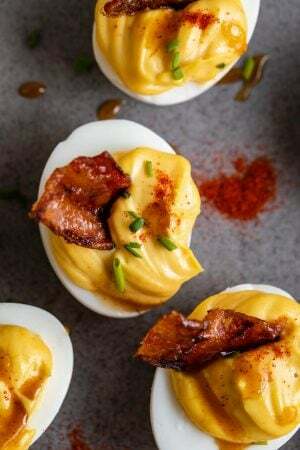 Let me know if you make the recipe and how it goes! Thanks again!